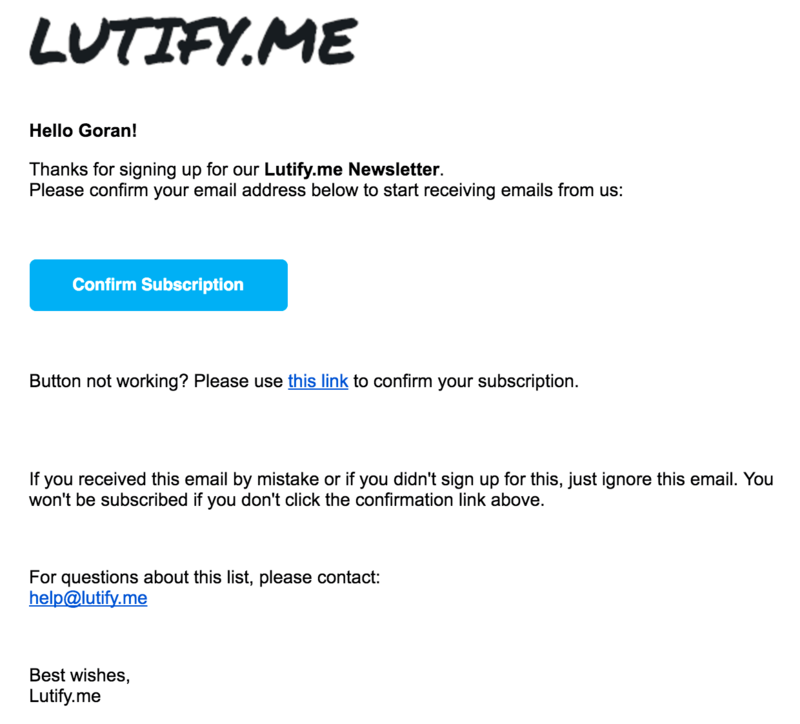 Lutify.me | I subscribed for the newsletter to get free LUTs but never received a download link. What should I do? Registration for our newsletter is a 2-step process. To comply with best anti-spam practices we must ask our users to confirm their registration after completing the registration form. After completing the registration form for the newsletter you will receive a confirmation email asking you to confirm your registration. You must confirm your registration for the email with the download link to be sent. Please click the ‘Confirm Subscription’ button in that email to confirm your registration. After confirming your registration additional email with a download link for the free LUTs will be sent to you. Allow for up to ten minutes for the email with the download link to be delivered. This email is sent immediately after confirming your registration but sometimes due to the nature of how things work on the Internet that email may be delayed. Please note, sometimes a recipient’s email server may decide to delay the delivery of that email using a method commonly referred to as Greylisting. If that happens our email server will try to deliver that email later on but it’s up to the recipient’s email server to honor the reception of that email eventually. In most severe cases of Greylisting we’ve seen delays of up to 24 hours before the email is eventually delivered. If you waited for that email for more than 10 minutes but it still hasn’t arrived, please check your Promotions folder. Usually we receive reports from Gmail users about not delivered emails only to be found in the Promotions folder. At the top of your Gmail interface there are three folders by default – Inbox, Social, Promotions. It’s very common for that email to be in the Promotions folder. If you can’t find that email in the Promotions folder either, it may be possible that the email was delivered to the Spam/Junk folder. Please check these folder/s for the email with the download link. The subject of the email with the download link is ‘Welcome to Lutify.me – Download your LUTs’. If you still can’t find that email, it’s possible that the email with the download link is being greylisted by your email server – see step 1. In such case please allow for up to 24 hours for the delivery. If after 24 hours you still haven’t received your download link, please contact us.